What would you say if you had to pick just 5 posts from this year as your best or favorites? 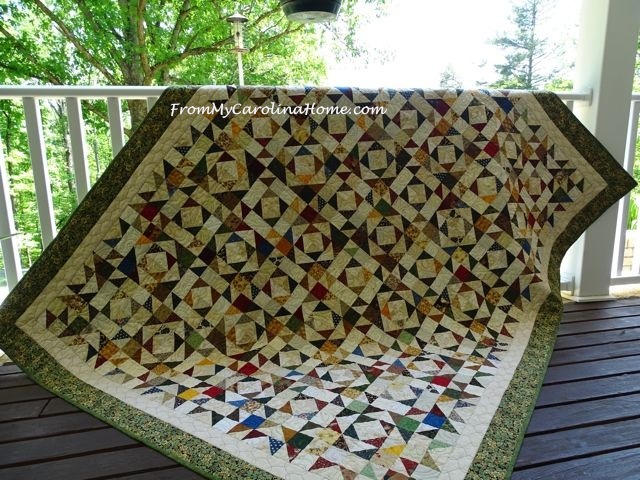 That is the task in order to link up a Best OF 2015 post for a challenge linky at Meadow Mist Designs. This isn’t going to be easy, as I blog about such a wide variety of subjects, just picking 5 subjects is challenge enough, LOL!! 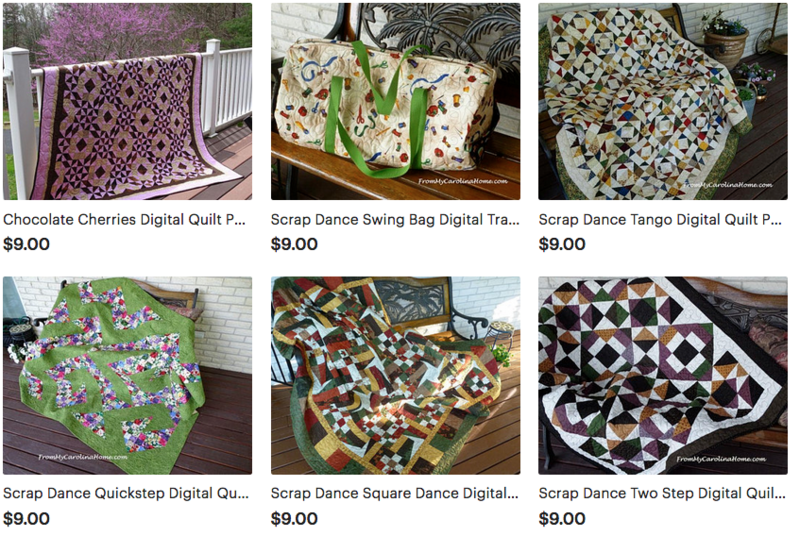 However, Quilting has to be one, and the post I am going to pick is the end of the Scrap Dance Mystery Quilt. This post shows some of our participant’s finishes, along with a link to the pattern and some other fun links. 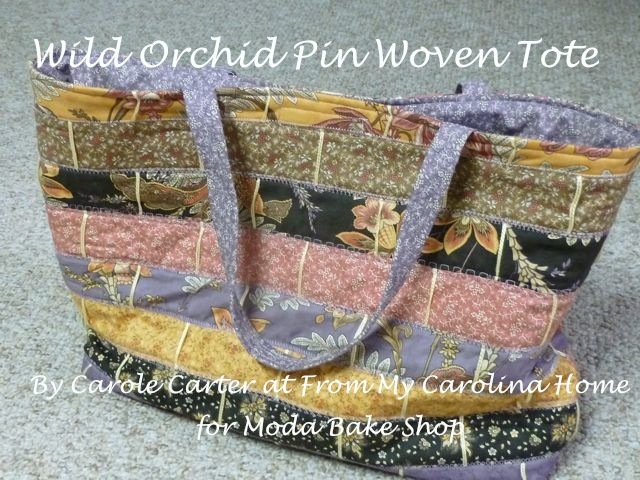 This pattern is for sale in my Craftsy store, just click on the picture on the sidebar. The next mystery, Scrap Dance Tango has begun! Click on the Scrap Dance Tango icon on the sidebar to get to the first post. Readers know that I love to cook, and frequently post original recipes. It was difficult to choose just one, I thought hard about the Bourbon Chicken, but I think I’ll go with the Perfect Deviled Eggs, the last deviled egg recipe you will ever need. Not only is the basic recipe given, with the perfect way to boil and peel them, every variation you could ever want is included. Next, what to choose? Something crafty, or needlework? I stamp cards, paint things, and play with my glue gun. I adore Mason jars, so maybe one of those crafty posts. 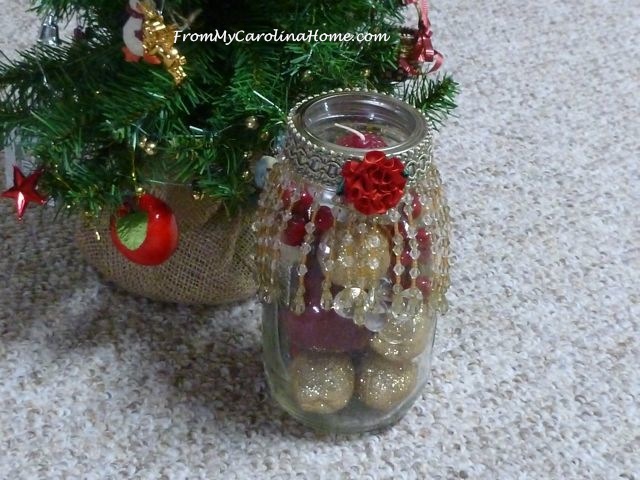 So, check out the Beaded Mason Jar. DH and I live in beautiful Western North Carolina, and we often go on day trips and excursions with our car club, or just hiking by ourselves in the local parks and mountains. 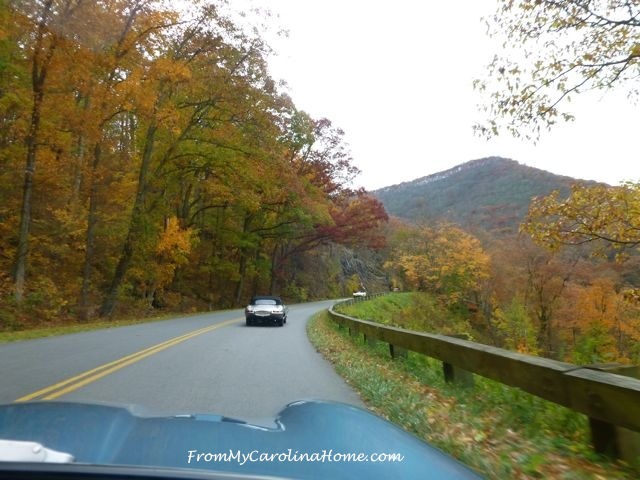 We live close to the Blue Ridge Parkway and spend many of our driving excursions there. Drives and events in this region are gathered into the category of Mountain Living on the sidebar. This Autumn Drive on the Blue Ridge Parkway was also a costume party for the car club. Decorating and tablescapes are frequent subjects for posts. I enjoy setting a beautiful table and serving a great meal to friends and family. Sometimes we host outside on the veranda with our gorgeous view (see the header). Sometimes DH lights a fire in the dining room/library and we enjoy a meal there. Either way, a lovely tablescape is essential. 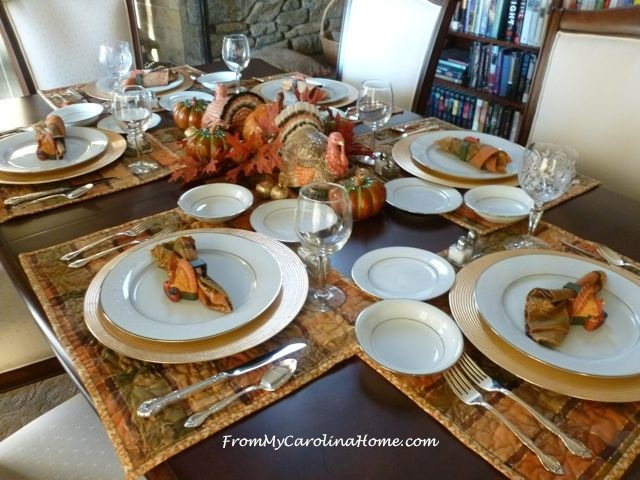 Enjoy this post with two tablescapes from just last month for Thanksgiving. Thanksgiving Tablescapes 2015. OK, so that is five. I could go on with the book reviews, gardening, needlework, button crafts, wool work projects and other tutorials, but I’ll have to let you explore on your own if you like. Thank you for stopping by and looking around. I hope you enjoyed your visit, and to my regular readers, thank you for faithfully reading my blog! What a great list, I really like how you picked a favorite from each of the categories you post about. Your mystery quilt is fabulous and you know I love your tablescapes! Fabulous posts! Thanks so much for sharing the deviled eggs. My husband made wonderful ones, but I’ve never had a clue about them, so I will try your recipe! I wishing you and yours a very Merry Christmas and a happy New Year filled of happiness!! Good Morning Carole! I do believe you have chosen great posts for this linky party. Although, choosing just 5 had to be extremely difficult; especially with all of your brilliant and beautiful crafty projects. Which with all of your outstanding creativeness in so many areas, I do not know how you could have narrowed it down to just one. I really look forward to digging deeper into your blog this year and discovering more of your talents, like ribbon work and beading. Both of which, I am interested in learning more about and definitely want to see what glorious beauties you have designed and created! Not to mention the all of the gorgeous table settings that are so unique and have truly caught my attention and made me a devoted fan and yes, I do believe as soon as garage sale season begins again…a new table decorator you have created. I also agree with your choice of the Scrap Dance Final with all of the treasured pictures. 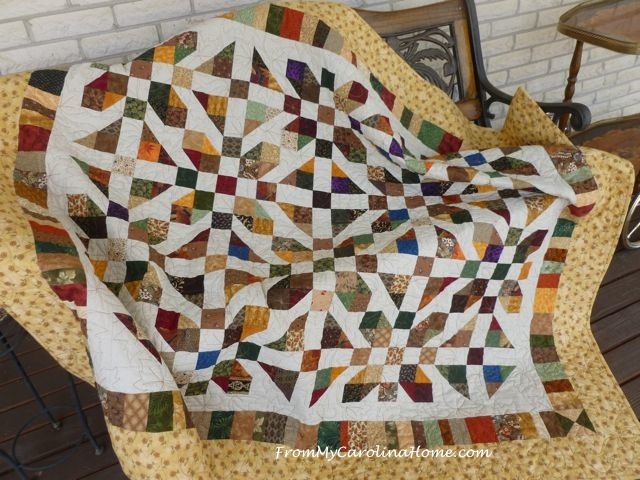 You designed such a gorgeous scrap quilt and this will help to broaden your audience. Although, I truly do not know how any quilter who does scrap quilts would not instantly jump on board and buy your pattern. As for the recipes, since I truly do little cooking or baking any more I am not sure on that choice. But again, you have shared so many amazing recipes and deviled eggs are one that many people fix year around for several events, so actually with a tad more thought, that is a great choice! I will be finishing up a couple of seams of gifts today, try and get my blog up and running again and then begin gift making again. I hope that you have a wonderful creative day! Although I’ve come across your blog on other linky parties, I never followed you until just now. 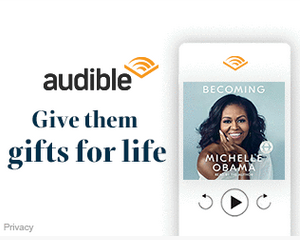 I can tell it will be a lot of fun, because now I’m enjoying not just your quilting, but also your tablescapes, book recommendations, and button crafts among other things you write about. Looking forward to many more! Glad you had a great 2015 and wishing you a wonderful 2016! 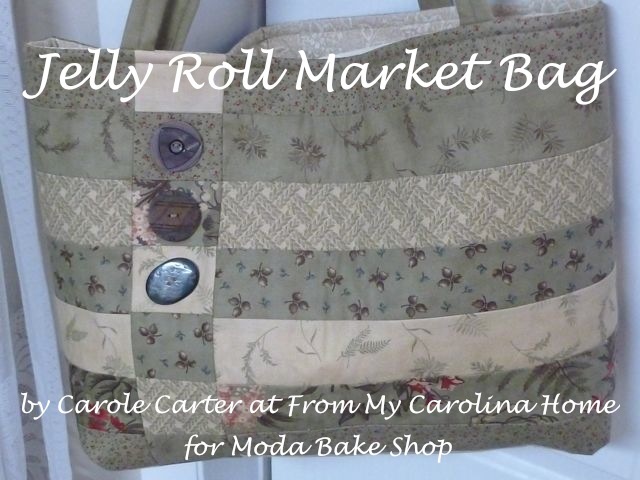 It’s always fun and worthwhile to look back Carole, and remember things that you’ve forgotten you did or created! Can’t wait to see what’s in store for 2016! The five you picked provide a wonderful snapshot of your blog. You cover lots of fun topics with lots of pretty pictures. I’ve book marked your deviled egg recipe. Great choices Carole. As a late-comer to your blog, I am more than impressed with all that you do. Looking forward to the new year and seeing your imagination at work…. 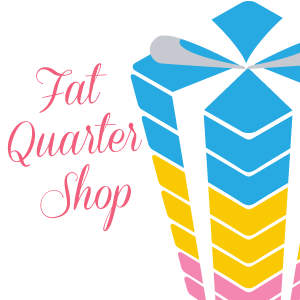 It’s been fun to meet new-to-me quilters on the linky party. I like the result of your 2015 mystery quilt-along. What’s the best way to keep informed about the 2016 mystery that begins in January? The best way would be to follow my blog, you can do that by email or on any one of the readers out there. Just sign up to follow on the sidebar. Thank you for asking! 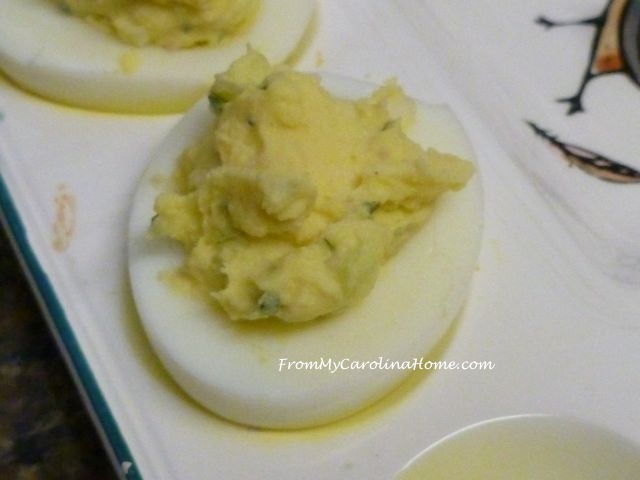 I love deviled eggs, so am going to give your ideas a try.. I can usually get the eggs boiled ok, but getting the proper amount of mayonaise sometimes is difficult for me. Thank you for your wonderful post today, we once lived in Virginia near the mountains and often took a drive into the mountains also. It was a wonderful experience, even camping in the park. I am looking forward to your 2015 botm. Cya Soon..
Love the idea for the mason jar filled with candies and then decorated. I have used the jars and filled the bottom with pretty shaped marbles from the craft store then added a flameless candle inside and used on the bookcase. Decorated the top similar to the way you did. If giving to a sewer or other crafter the jars can be filled with the aproperate crafting items and given as a gift.